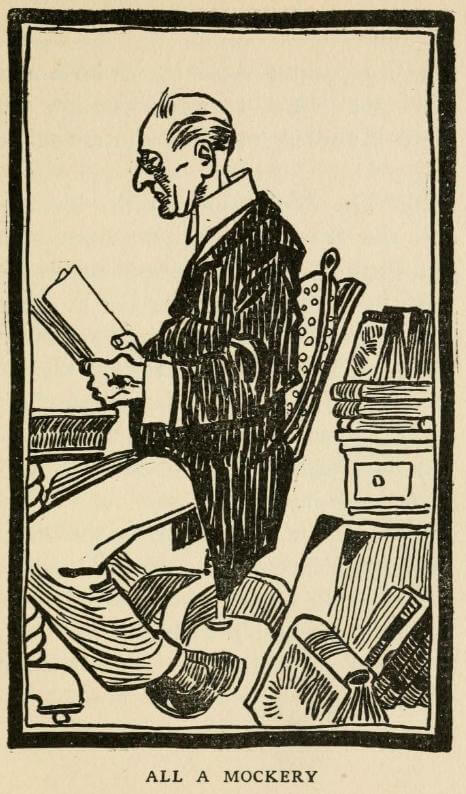 The Fable of the Man Who Didn't Care for Storybooks was published in Fables in Slang (1899). Reminiscent of works by his legendary mentor, Mark Twain. Once there was a blue Dyspeptic, who attempted to Kill Time by reading Novels, until he discovered that all Books of Fiction were a Mockery. 1. The Book that Promises well until you reach the Plot, and then you Remember that you read it Summer before last. 2. The book with the Author's Picture as a Frontispiece. The Author is very Cocky. He has his Overcoat thrown back, so as to reveal the Silk Lining. That Settles it! 3. The Book that runs into a Snarl of Dialect on the third Page and never gets out. 4. The delectable Yarn about a Door-Mat Thief, who truly loves the Opium Fiend. Jolly Story of the Slums. 5. The Book that begins with a twenty-page Description of Sloppy Weather: "Long swirls of riven Rain beat somberly upon the misty Panes," etc., etc. You turn to the last Chapter to see if it Rains all the way through the Book. This last Chapter is a Give-Away. It condenses the whole Plot and dishes up the Conclusion. After that, who would have the Nerve to wade through the Two Hundred and Forty intermediate Pages? 6. The Book in which the Pictures tell the Story. After you have seen the Pictures there is no need to wrestle with the Text. 7. The Book that begins with a Murder Mystery—charming Picture of Gray-Haired Man discovered Dead in his Library—Blood splashed all over the Furniture—Knife of Curious Design lying on Floor. You know at once that the most Respected and least suspected Personage in the Book committed the awful Crime, but you haven't the Heart to Track him down and compel him to commit Suicide. 8. The Book that gets away with one Man asking another: "By Jove, who is that Dazzling Beauty in the Box?" The Man who asks this Question has a Name which sounds like the Title of a Sleeping Car. You feel instinctively that he is going to be all Mixed Up with that Girl in the Box before Chapter XII. is reached; but who can take any real Interest in the Love Affairs of a Man with such a Name? 9. The Book that tells all about Society and how Tough it is. Even the Women drink Brandy and Soda, smoke Cigarettes, and Gamble. The clever Man of the World, who says all the Killing Things, is almost as Funny as Ally Sloper. An irritable Person, after reading nine Chapters of this kind of High Life, would be ready to go Home and throw his Grandmother into the Fire. 10. The dull, gray Book, or the Simple Annals of John Gardensass. A Careful Study of American Life. In Chapter I. he walks along the Lane, stepping first on one Foot and then on the Other, enters a House by the Door, and sits in a four-legged wooden Chair, looking out through a Window with Glass in it. Book denotes careful Observation. Nothing happens until Page 150. Then John decides to sell the Cow. In the Final Chapter he sits on a Fence and Whittles. True Story, but What's the Use? Why continue? The Dyspeptic said that when he wanted something really Fresh and Original in the Line of Fiction he read the Prospectus of a Mining Corporation. Moral: Only the more Rugged Mortals should attempt to Keep Up on Current Literature. Add The Fable of the Man Who Didn't Care for Storybooks to your own personal library.